If you’re trying to get someplace, it helps to know where you are. In the case of diabetes management with intensive insulin therapy, this means tracking blood glucose (BG) levels, which are constantly in flux due to a range of factors such as diet, exercise, stress, insulin dynamics, health status, etc. Maintaining BG levels within a desirable range can be challenging. 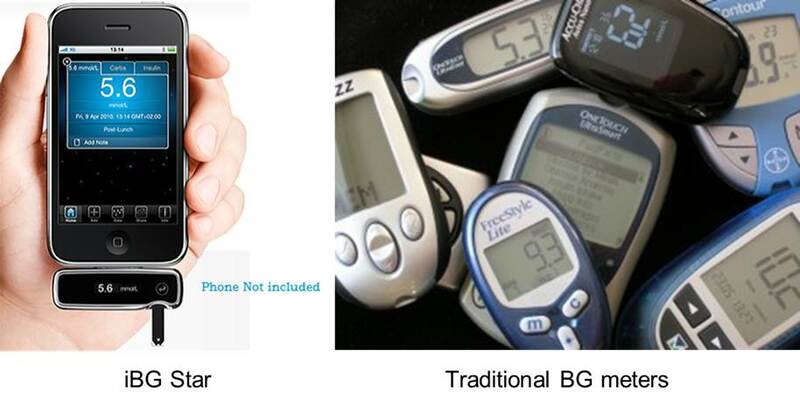 Traditionally, patients maintain glycemic control by manually taking BG measurements 3-6 times a day with a finger-stick test and managing carb consumption and insulin administration based on these measurements. In my view, this approach is somewhat analogous to navigating a winding road with many intersections using a GPS SatNav system that only reads out once every few hours! Common issues with traditional therapy include over-correction (potentially leading to dangerous episodes of hypoglycaemia) and under-correction (result: hyperglycaemia). Nocturnal hypos are an area of particular concern, with estimates suggesting prevalence as high as 68%. Continuous Glucose Monitoring (CGM) was developed to improve this situation by allowing diabetics to automatically measure their glucose levels on a continuous basis. Today, this is done using disposable body-worn sensors that sample glucose levels in subcutaneous interstitial fluids, which are known to be strongly correlated with blood glucose, with a slight lag (around 10 minutes). As illustrated in the diagram below, CGM can provide a more complete picture of glucose level variability, revealing important peaks and troughs that would otherwise not be evident using only traditional intermittent BG testing. Moreover, CGM can detect emerging trends in real time, allowing for intervention before unsafe BG levels are reached, and can reveal correlations with other factors such as diet and exercise. CGM also offers greater convenience and discretion for patients and reduces the number for finger-stick blood samples required (usually twice a day for calibration). All these reasons make CGM a highly promising device innovation, accounting for why this is the fastest-growing diabetes product segment (currently 20% per year). The current market leader in CGM is US-based Dexcom, which is listed on NASDAQ with a market cap of around $2 billion at present. Dexcom’s latest sensor (the G4 PLATINUM launched in 2012) is widely seen as the best device commercially available, offering the greatest accuracy and comfort. In 2012, Dexcom had sales of almost $100 million—enjoying an astonishing 41% growth in the year—while still generating an annual operating loss of nearly $56 million. This hyper-growth, combined with the “land grab” potential of the large market being addressed, is probably the reason Dexcom enjoys such a substantial market cap and a generous valuation of 20x sales, despite being loss-making since its IPO in 2005. Unlike its rival Medtronic—which has its own CGM technology—Dexcom is exclusively focussed on sensing and does not have a proprietary insulin pump. Instead, Dexcom’s business model is to directly sell sensor systems only and to license access to its sensors to third party pump producers for integration with their insulin pump systems. Dexcom has such licensing arrangements with J&J/Animas and Tandem and, in the past, had a collaboration with patch pump leader Insulet, which it later abandoned under circumstances that are understood to be less than amicable. As competition in the CGM market heats up, Dexcom’s current dominance may soon be rivalled. Medtronic is increasingly strengthening the value proposition of its integrated system by using its CGM to automatically control insulin delivery. Meanwhile, Roche is understood to be developing a new CGM sensor that is said, by clinicians familiar with the technology, to be the best sensing system yet. Lastly, Insulet is known to be developing a combined insulin patch-sensor device that combines in one patch both insulin delivery and glucose measurement. This could be attractive to patients who don’t wish to simultaneously wear two devices on their body. At present, all CGM sensors currently available are disposable body-worn patches that are replaced every 3-7 days (with the latest generation of sensors generally operating at the longer end) and which sample interstitial fluids through a small in-dwelling transcutaneous electrochemical glucose oxidase sensor. Several groups are working on technologies that might change this paradigm. For example, Senseonics is developing an implantable, miniature CGM sensor that would be functional in vivo for 6-12 months. Promising validation results have already been reported and the company anticipates a European launch by the end of 2014. Non-invasive glucose sensing is the holy grail of this field, but a notoriously challenging nut to crack. One fascinating approach is being pursued by Prof John Pickup at King’s College in London, where his team is working on a non-invasive glucose sensing technology based on a reversible glucose-binding protein attached to a flourophore that can be optically measured across the skin. A potential embodiment of this system would be a “smart tattoo” that would be read by an external sensor communicating with a smartphone. An interesting wild card in this area could be the consumer electronics giant Apple, which some industry observers believe might be developing glucose sensing for its rumoured iWatch product. This speculation has been fuelled by Apple’s recruitment of staff from the recently shuttered C8 Medisensors, which was developing non-invasive optical glucose sensing technology. Time will tell whether non-invasive glucose sensing ever makes its way into prime time use. But for the first time this appears to be moving out of science fiction into reality, as Abbott unveiled at the recent EASD congress in Barcelona its Flash Glucose Technology system based on a non-invasive body worn sensor that is worn for 14 days. Abbott expects this will be approved and launched in Europe in 2014. This will definitely be a product to watch as more information comes to light. The clinical benefit of using CGM has been shown in a range of studies demonstrating the improved glycaemic control achievable through by CGM (eg, JDRF/NEJM 2008) and, in particular, the benefits of its use in combination with pump therapy (STAR/NEJM 2010). Despite mounting evidence of benefit, widespread adoption of CGM still limited. In the US, Medicare does not have a national coverage policy for CGM; but reimbursement is provided under local coverage determinations and many private insurers cover CGM. In the UK, reimbursement is not in place and CGM is used on a case-by-case basis and often only for a limited period of time during corrective observational windows (however, NICE is expected to review this soon). One barrier to adoption may be that in order to secure the benefits of CGM, patients need to be highly skilled in self-management in order to make use of real time CGM data, which provides much more information on glycemic levels than traditional measurements. Furthermore, excessive “nuisance alarms”, especially while sleeping, have been seen by some people as undermining the user experience. A solution to these problems would be a system-based solution that provides greater automation and decision support. Groups like the JDRF are vigorously promoting this vision of a fully automated, closed-loop “artificial pancreas” system that senses glucose levels and automatically delivers and doses insulin (and possibly other hormones) using smart algorithms. While a true artificial pancreas is still a ways off (with some experts questioning whether this will ever be practicable), in the near term we can expect to see greater use of semi-closed loop functionality, especially for safety purposes. Indeed, just this past week Medtronic announced that the FDA has approved for the first time a system to deliver the initial rudiments of an artificial pancreas, with the “Threshold Suspend” feature in its new MiniMed 530G with Enlite (a similar system, Paradigm VEO, has been available in Europe since 2012). This is the first device ever approved under the new FDA product classification, “OZO: Artificial Pancreas Device System, Threshold Suspend”. Meanwhile, Medtronic is also doing the heavy lifting of creating a new reimbursement code with CMS for an artificial pancreas. 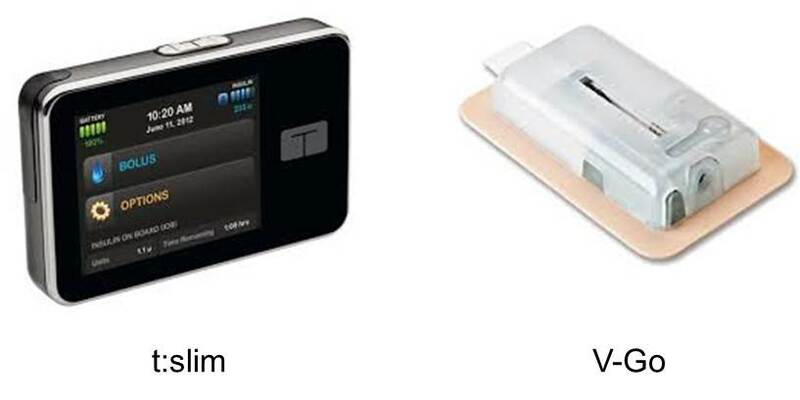 The Medtronic system integrates an insulin pump with a CGM sensor, shutting off insulin delivery when glucose levels are too low in order to prevent hypoglycaemia when the patient is unable to self-monitor (eg, while sleeping). The benefits of this feature—mainly reduced rates of nocturnal hypos—were initially reported in smaller studies conducted in Europe by investigators such as Pratik Choudray (Diabetes Care 2011). More recently, Medtronic completed a larger randomized control trial called ASPIRE in order to support its FDA submission. The ASPIRE study looked at 247 patients with T1D, half of whom were provided a MiniMed integrated system (CGM with insulin infusion) with Threshold Suspend used to monitor glucose levels and to end insulin infusion when dangerously low levels are reached. The study, as reported this summer in the New England Journal of Medicine, found that the combination device reduced night-time hypoglycemia by nearly 32% and lowered the degree and duration of hypoglycemic events by 37.5%, all without serious adverse events. Threshold Suspend is really just the first, small step towards a true artificial pancreas. Next-generation products are expected to use smarter “predictive” algorithms that will suspend and modulate insulin delivery based on trending BG values before critical thresholds are reached, with increasingly reduced interaction from patients required. Predictive algorithms have the potential to help transform diabetes management from a “rear view mirror” perspective to something that’s more forward looking. The goal of increasingly replicating the function of the pancreas may ultimately include delivery of glucagon as a positive control loop against hypo and will likely take into account a wider range of physiological parameters (eg, Dr. Wolpert at the Joslin has recently shown that dietary fat affects glucose concentrations and insulin requirements). Indeed, research organisations such as the Joslin are actively working on developing validated algorithms for decision making and controlling close-loop systems that may become the gold-standard in third-party systems (ie, “Joslin Inside”). Achieving the vision of a true artificial pancreas might ultimately depend on an open innovation model that combines best in class insulin delivery systems, sensing technology, control algorithms and disease management tools. The shape of any eventual artificial pancreas solution may even provide some surprises. As reported by Diabetes Mine, the JDRF and Sansum Diabetes Research Institute are developing a somewhat counter-intuitive artificial pancreas concept using rapid-acting inhaled insulin. With so many interesting and promising ideas currently under investigation, these are indeed exciting times for device innovation in diabetes! Insulin Pumps: You’ve come a long way, baby! The first attempt at a “portable” insulin pump was made back in the 1960s by Dr. Arnold Kadish, a private doctor in Beverly Hills, CA. 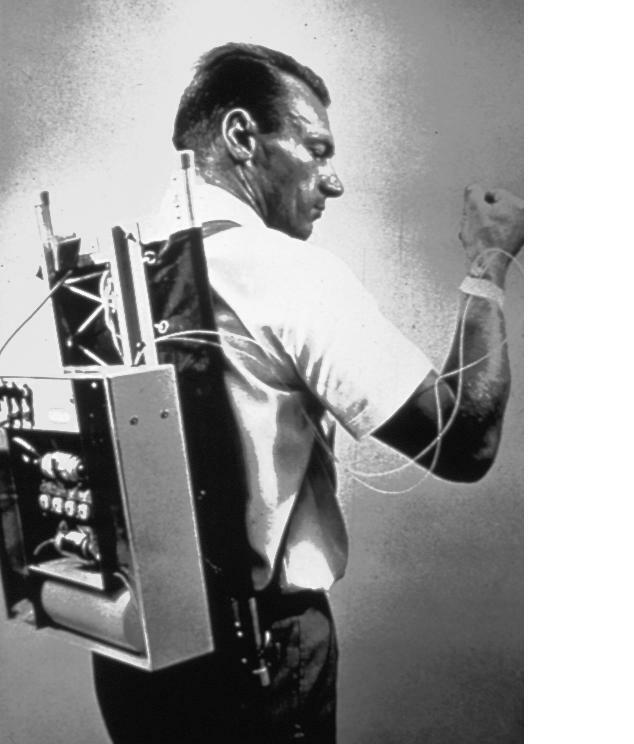 His backpack-sized contraption (pictured below) was in some ways years ahead of its time, ambitiously seeking to act as an artificial pancreas—which is still considered to be the holy grail of this field—through a closed-loop insulin delivery system consisting of an adapted lab Autoanalyser to measure blood glucose, a venous blood circuit and a servo-mechanism pump. While this represented an important proof-of-concept, the system’s size, complexity and its dependance on intravenous access made it impractical. Things really began to take off in the 1970s, with major progress being made both in developing a practical, portable insulin pump and in validating its cinical use. Prof. John Pickup (King’s College, London) is regarded by many as the father of pump insulin pump therapy for his pioneering work as a research fellow at Guys Hospital, London, where he developing a simple, portable pump (159g—pictured below) for continuous subcutaneous insulin infusion (CSII), providing both basal therapy and a pre-set bolus dose. Insulin pump from the 1970s developed at Guys Hospital, London, by John Pickup. 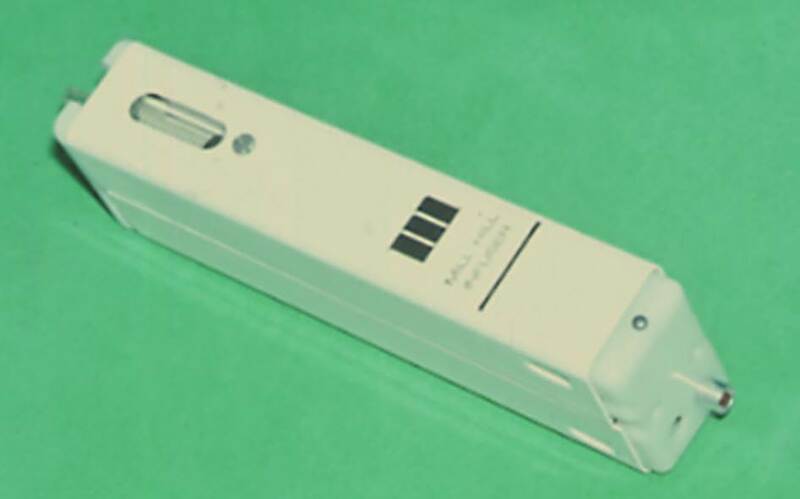 The button on the end was pressed to deliver the meal-time bolus, fixed at 8 times the basal rate for 15 min. This pump is now in the Science Museum in London. Previous pumps had delivered insulin intravenously, which is not suitable for long-term therapy due to the risks of septicaemia and thrombosis. Pickup began clinical use of his device in 1976 and two years later the BMJ published his seminal paper describing CSII for achieving long-term diabetic control. Around the same time, other groups were also active in this area, giving rise to a little trans-Atlantic rivalry. Perhaps most famously, US-based Dean Kamen (also the inventor of the Segway and the HomeChoice peritoneal dialysis system) developed his AutoSyringe portable drug infusion pump in the mid-1970s, which was initially used for chemotherapy and neonatology and later adapted for insulin therapy. Over the years, insulin pumps have continued to improve in terms of size/portability, ease of use, functionality and reliability. Today, pumps for CSII can fit in the palm-of-the-hand and are considered to be the gold standard therapy for type 1 diabetes (T1D) patients. Insulin pumps are a major medical device product segment generating $2.5 billion in annual global sales and growing at 15% per year—making this the second-fastest growth segment in diabetes products. The benefits of pump therapy for T1D (ie, insulin dependent) patients are well established (eg, Cochrane Review and the DCCT trial). Due to the more physiologically compatible profile of insulin delivery compared with multiple daily injections (MDI), pump therapy leads to better glycemic control (A1C) and fewer hypoglycemic events (eg, NICE review) while offering greater accuracy and patient convenience. In light of this, most countries offer pump therapy to eligible T1D patients, with utilization rates ranging from around 40% in the US (estimated to grow to 50% by 2018) to an average of 15% in Europe. Ironically, given its role in pioneering pump therapy, the UK is a notable laggard, currently at around only 7%. However, NHS primary care trusts have a statutory obligation to provide funding for insulin pumps and UK clinical guidelines provide clear eligibility criteria for T1D patients having (1) frequent hypos, causing “persistent anxiety” or (2) A1C levels above 8.5%. As awareness of this expands, helped in part by greater patient demand and advocacy by groups such as INPUTdiabetes, UK adoption rates are expected to converge with European norms. For the past couple of decades, the MiniMed pump (Medtronic) has held a dominant market-share in insulin pumps based on a strong body of clinical evidence on the benefits of pump therapy and through leadership in integrating pumps with continuous glucose monitoring (CGM). However, more recently, traditional tubed pumps like the MiniMed Paradigm, Spirit (Roche) and Animas (J&J) have been severely challenged by smaller, more discreet body-worn “patch pumps”. The market pioneer in this category has been Insulet, which launched in 2005 its first generation patch pump, the OmniPod. A couple of years later, loss-making Insulet completed its IPO on NASDAQ, after reporting 2006 sales of $3.6m with a cost of goods sold of $15.6m (practically shipping dollars with every pump sold). The IPO raised nearly $120m in funds at a market cap of around $385m; on top of nearly $120m in venture funding that had already been invested. Since its launch eight years ago, OmniPod—until now the only patch pump available for T1D—has captured a 10% share of the overall insulin pump market, with annual sales growth of over 30% in recent years. But this growth has come at a price, as historically Insulet has suffered from a high cost of goods in producing its 3-day disposable pump—which is why in the full year 2012 the company was still loss making (operating loss of around $36m) despite substantial annual sales of over $210m. Nonetheless, investors don’t seem to mind much, giving this loss-making company a current market cap of over $1.7 billion, which values the business at a hefty 8x historical sales. The company and its investors appear to be hopeful that, following the launch earlier this year of its smaller and cheaper (to produce) Gen2 OmniPod, light is finally visible at the end of the long tunnel to profitability. One of the questions around patch pumps has been what, if any, clinical benefits these devices might provide, beyond mere convenience. Work by Dr Howard Zisser (Sansum Diabetes Research Institute, Santa Barbara, CA) suggests that patch pumps have the potential to offer improved glycemic control over conventional tubed pumps due to the fact that tubed pumps may have to be disconnected for activities such as swimming, bathing, participating in sports or intimate moments, whereas patch pumps are more suitable for such purposes—thereby avoiding the need to disconnect, which has been shown to result in a rise of 1 mg/dl in blood glucose for each minute that insulin delivery is interrupted. Competition in the patch pump space will soon heat up. Several new entrants—such as the Cellnovo system, the JewelPump from Debiotech and, possibly, the SOLO from Medingo/Roche—are expected to be launched over the next year or so. Offering the world’s first mobile-connected diabetes pump system, Cellnovo (pictured below) has the potential to be a game-changer—which is why my fund NBGI Ventures has backed the company (where I’m also a board member). Cellnovo integrates a highly accurate, small patch pump; a proprietary color touch-screen controller having an integrated blood glucose test-strip reader and providing a platform for a range of diabetes managment apps; and mobile data connectivity and web-based remote monitoring. An example of just one useful feature is the automated bolus calculator, which provides bolus dosing recommendations based on values obtained from its integrated blood glucose meter and its food journal app for counting and tracking carbs intake. This type of “automated bolus advisor” provides not only convenience, but has also been shown to improve glycemic control, as demonstrated by the ABACUS study. Mobile connectivity will automate data collection around important parameters such as insulin dosing, blood glucose values, physical activity and food/carb intake. This will liberate patients from paper-based record-keeping while providing accurate and complete information to physicians and timely alerts to parents and carers. With its minimalist sleek lines, discreet size, graphical touchscreen interface, and automated wireless connectivity—the Cellnovo system looks more like an aspirational high-end consumer electronic device than a clunky medical product. In a patient-centric world, intuitive usability and appealing aesthetics are important considerations for a device that will be worn and used 24/7. A recent research report by the investment bank Canaccord Genuity noted that, with its CE marked system and an initial commercial launch expected later in 2013, “Cellnovo is the closest competitor to Insulet”. Of course, as ever, the market—and patients in particular—will be the ultimate arbiter. Meanwhile, we can all take satisfaction in seeing how much these devices have evolved since their early, awkward beginnings fifty years ago, bringing meaningful improvements to the lives of hundreds-of-thousands of patients. The future will surely deliver even greater gains, with promising work already underway in implantable pumps, improved CGM technologies integrated with closed-loop systems (more on these later), prefilled insulin cartridges/pumps, and enhanced integration across a range of wireless devices. Afflicting nearly 350 million people worldwide, diabetes is a lifelong condition that can be effectively managed, but not yet cured. Prevalence is set to dramatically rise in developing countries, as greater numbers of people adopt a Western lifestyle, with all its attendant consequences. This will place an increasing burden on health systems everywhere, posing a major policy and delivery challenge. Research by the consultancy firm Booz Allen highlights the magnitude of this issue, noting that “diabetes is the most expensive disease cost-wise in the U.S.”, accounting for one-out-of-four of every health care dollar spent. The direct medical cost of treating diabetes is only the tip of the iceberg, with billions of dollars of additional indirect costs incurred due to lost productivity and social welfare support. Diabetes is also big business. The global diabetes products market was estimated to be over $40 billion in 2010, and is expected to grow to nearly $120 billion by 2018. Blood glucose (BG) test strips alone accounted for $10 billion in annual sales—which is five times the size of the much ballyhooed molecular diagnostics market. But size isn’t everything and all is not rosy for the big manufacturers, as competition and price pressures have ruthlessly eroded margins to the point that some of the major players (eg, Roche, Bayer) are understood to be looking to exit the BG monitoring market. A market this large facing uncertain headwinds is ripe for innovation and disruption. When a big problem meets a big business opportunity, innovators, investors and entrepreneurs take heed! Indeed, diabetes has inspired many start-ups dedicated to delivering better products and solutions. This is an exciting field, ripe with potential; and one where I’ve been active by leading an investment from NBGI Ventures in Cellnovo, which has developed a mobile diabetes management system (more about this in a subsequent post). Innovation in medical devices—particularly in the areas of insulin delivery and BG monitoring—has played an important role in improving diabetes care by empowering patients and enabling self-care. Diabetes management is a leading area of patient-centric medicine, serving as a validation test bed and exemplar for solutions relevant to a range of other chronic diseases. The goals and methods of the patient-centric care model also align strongly with another powerful medtech trend: the emerging digital health movement that embraces the convergence of mobile connectivity, information technology and data analytics with medical devices and healthcare delivery. Therefore, it should come as no surprise that diabetes is a major focus area for advocates of digital health solutions, as reflected by the GSMA’s (the global industry alliance of mobile operators) prioritization of diabetes in its mHealth initiative for connected living. The patient-centric care paradigm also respects the importance of product design, usability and patient choice in achieving better outcomes and improved quality of life. A good example of the commercial relevance of this is the rapid adoption of the discreet OmniPod patch pump by Insulet—driven largely by patient preference—at the expense of market share lost by traditional tubed insulin pumps such as the MiniMed by Medtronic. Of course, innovation goes far beyond just good product design. At the recent American Diabetes Association (ADA) congress in Chicago, a range of promising approaches were reported and discussed, including improved continuous glucose monitors (CGM), closed-loop pumps integrating CGM feedback (ie, an artificial pancreas), dual drug delivery systems, improved glucagon formulations and even wilder ideas such as engineered/regenerative pancreatic tissue, exercise mimetics and neuromodulation-based therapies. Neuro-Modulation/Stimulation (NMS) is a particularly interesting field having a broad range of potential medical applications that are just now being explored more widely. A rather conventional application for NMS relates to pain management, which Neurometrix has developed with its SENSUS TENS device for treating diabetic neuropathy. SENSUS is a body-worn transcutaneous electrical nerve stimulator designed to provide symptomatic relief from pain through the excitation of nerve fibers to block transmission of pain signals to the brain (ie, exploiting “gate theory”). An even more novel NMS approach is being pursued by a Metacure with its DIAMOND (TANTALUS) “gastric pacing” implanted stimulation device for treating obesity and type 2 diabetes (T2D) by inducing satiety and, putatively, modulating signaling to the brain, affecting glucose and fatty acid metabolism. This echoes the bariatric approach being pursued by another device startup, GI Dynamics, which has recently raised almost $60m to further fund the development and commercialisation of its orally inserted intestinal liner EndoBarrier that prevents food absorbtion, mimicking the effects of a gastric bypass to treat obesity and T2D by affecting mechanisms broadly underlying metabolic syndrome. For me, as a medtech investor, one of the most notable commercial developments at the ADA was the emergence of new players in the insulin pump space. Targeting the established market segment of tubed pumps for type 1 diabetes (T1D) patients, Tandem’s t:slim very much embraces the principles of attractive product design and usability. Meanwhile, the V-Go from Valeritas—targeting the nascent, but potentially much larger T2D market segment—is a “cheap and cheerful” disposable insulin delivery device seeking to capture market share from prefilled insulin pens. A few weeks ago, decision-makers in cardiology from around the globe descended on Paris to attend EuroPCR. Alongside TCT in the US, this is one of the biggest, most important gatherings in the field of interventional cardiology—bringing together clinicians, researchers, inventors, industry executives, investors, bankers, and everybody else with an interest in this area. Cardiologists are renowned for their openness to innovation and for rapidly pioneering and adopting bold new therapies: from angioplasty balloons in the 1970s, to coronary stents in the 1980s, and from catheter-based heart valve implantations in the noughties to renal denervation in the current decade. These treatments address major clinical needs and big market opportunities, attracting the attention of large corporate players and start-ups alike. Consequently, cardiology has been a rich source of successful investments in the medical devices space, accounting for a large share of returns to venture investors. This year at EuroPCR, several themes were prominent: TAVI, renal denervation, next generation stents and drug eluting devices. Additionally, interesting work continues to be done to develop interventional approaches for mitral valve repair/replacement and for treating heart failure. Transaortic Valve Implantation (TAVI)—catheter based procedures and devices for replacing heart valves without open-chest surgery—continued to generate interest, with numerous scientific sessions dedicated to reporting results from second generation devices designed to simplify the procedure and to achieve improved outcomes (eg, reduce stroke rates, post-procedure pacing and paravalvular leak). German physicians been early pioneers in this field and have the largest case volumes in Europe. The German clinical approach of the “joint heart team”, which combines both interventional cardiologists and cardiac surgeons in unified decision-making, is a model in best-practice and patient centric care. Interventional cardiologists conduct TAVI procedures through trans-femoral (TF) access (eg, MDT/CoreValve), while cardiac surgeons implant through more direct routes such as the trans-apical (TA) access (eg, EW/Sapien). While the TF route can be attractive due to the purely percutaneous nature of the procedure, the TA approach is sometimes necessary due to vascular access issues and, as noted by Dr Hendrick Treede at the TAVI session at EuroPCR, TA procedures can also offer compelling clinical benefits such as lower rates of PV leak and stroke. Under the joint heart team approach, both specialists jointly decide on, and participate in, providing optimal patient care to each patient. This represents a much welcomed “entente cordiale” in the on-going battle for patients between ICs and surgeons. The consequences of this joint decision-making are reflected in clinical practice: in Germany the case-load is roughly 50/50, whereas in other countries it’s typically 70/30 TF/TA. It will be interesting to continue tracking procedure rates and outcomes as adoption of TAVI expands both in volume and location. New technologies will likely influence practice patterns as systems migrate towards lower profiles and TA delivery becomes more “percutaneous” with new access and closure systems that simplify the procedure and eliminate the need for rib-spreading. Several TA access/closure systems were discussed in TAVI sessions, with Apica Cardiovascular presenting the most developed offering so far, as cardiac surgeon and clinical investigator Dr Joerg Kempfert (Kerchoff-Klinik) reported a 100% procedural success rate (n=32) in its CE Mark study. One of the big questions around TAVI is the ultimate size of this fast-growing market, which in 2012 was estimated to be $1 billion. Wall Street consensus is that this will grow to a $2-3 billion market by 2017. Longer term, even higher volumes are possible if the use of TAVI migrates from inoperable/high-risk patients to lower risk patients as the long term safety, efficacy and durability of this approach are better established. Regulators and reimbursement authorities are already alive to this issue. Whichever way the market unfolds, this will undoubtedly remain an exciting space as innovative next generation products are introduced and incumbents and new entrants alike battle for market share. Welcome to Medtech Blog, in which I will be writing occasional thought-pieces and commentary on the medtech industry, digital health, startups and venture investing. I hope you will find this useful or at least entertaining. This is work in progress, so please be patient! Your comments and feedback would be greatly appreciated.